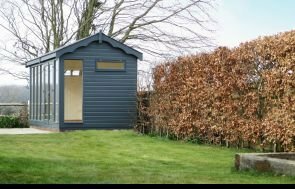 This attractive garden building is a 2.7 x 4.2m Langham Garden Studio, and it has been installed in a secluded spot of our customer’s garden in Burgess Hill, West Sussex to use as an office to run their accountancy business from. As with all of our bespoke timber buildings, the studio was delivered and assemlbed at the customer's address by our in-house installations team. The Langham is a popular choice to be used as a garden office, as it has desk height windows. 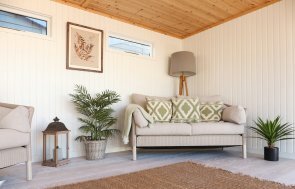 All of our Garden Studios come with full insulation, natural matchboard lining and double glazing as standard, which perfectly enables year-round use. The customer just needed to add an electric pack to their order, so they will be fully set-up to use their studio as intended. Externally, the Studio blends in well with the customer’s garden due to the grey slate effect tiles on the roof, black guttering on the front side to stop excess rainfall dripping on the doors and windows, weatherboard cladding to give a rustic feel, and shiplap cladding painted in our Valtti Paint Range in the colour Slate. For more information on our range of buildings, please come and visit our East Sussex Show Centre, or call us on 01760 444229 to speak to our helpful team about your requirements.